A refractometer is an optical instrument made of high quality aluminum is used to measure the concentration or refractive index of liquids. The RHB-10ATC, is specially designed to work with sugar-related liquids such as low sugar fruits and vegetables juices, Reamsian Bodily Fluids (per the Reams Biological Theory of Ionization), Maple Sap or for synthetic or semi-synthetic coolants, soft drinks and wine (for machining and grinding coolants, please consult the Technical Data Sheet for appropriate concentration of fluid). It can help the user monitor the specific percentage of sugar concentration in food and beverages, and is especially practical for people involved with food harvesting, processing and packaging. This model is designed to give HIGHLY accurate readings with 0.10 Brix divisions (accuracy is +/- 0.10 Brix). This unit is TWICE as accurate as 0-32% models!All RHB models use ambient light which means battery or power source is not required. Models with the ATC suffix are equipped with Automatic Temperature Compensation for accurate measurements without recalibration after shifts in ambient working temperature (for field use). 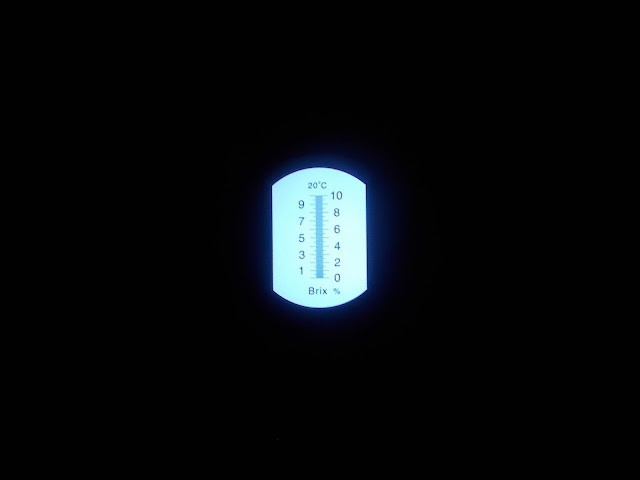 Against bright external light, the user looks through the eyepiece of the Brix Refractometer to see the reticle scale. 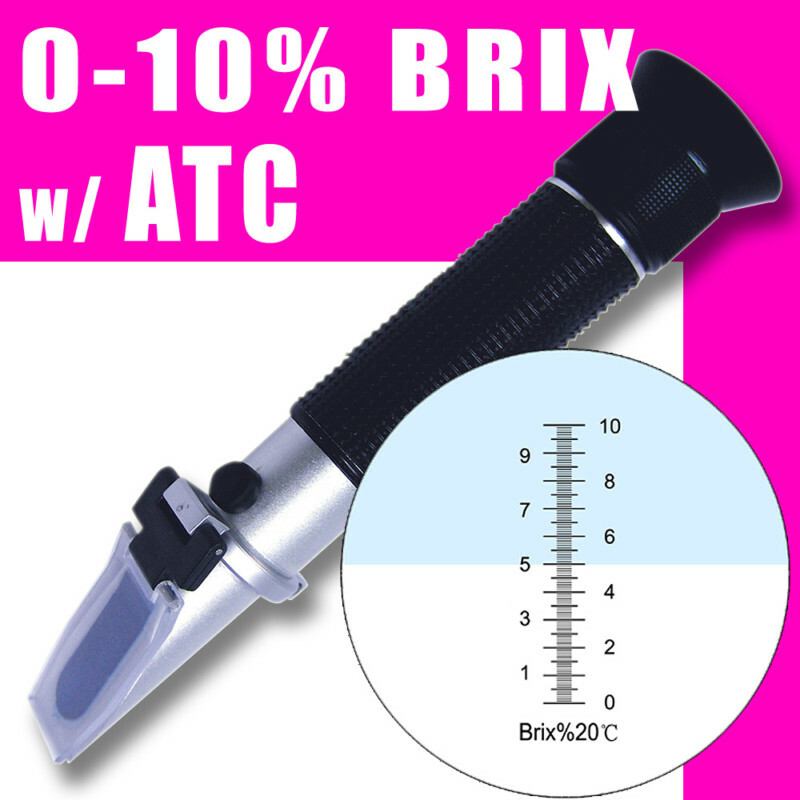 The Brix Concentration (in percentage units) is the mark on the scale where the light and dark boundaries meet, with one to two drops of liquid specimen spread across the refractometer's prism glass surface. With the Brix Refractometer RHB-10ATC, you can easily check the ripeness of fruits in the field, or test the concentration of sugar in food and beverages to ensure product quality. Definitely easy to use and calibrate, this accurate optical device has a durable, lightweight body with a comfortable eyepiece and non-slip rubber grip. It also comes with its own calibrating mini-screw driver and pipette as accessories. 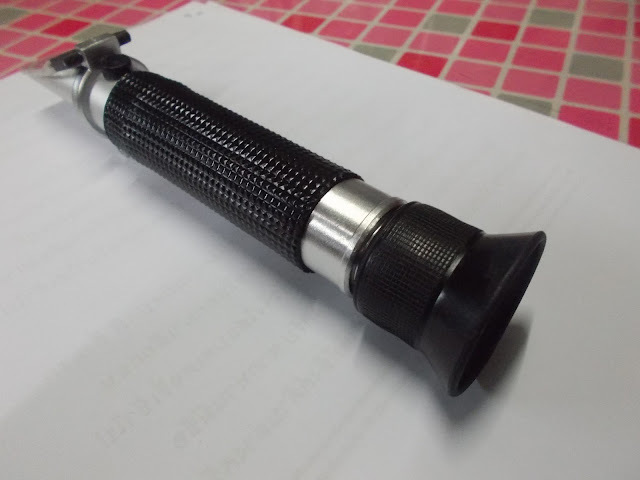 Aim the front end of the refractometer to the direction of bright light and adjust the eyepiece (manual focus adjustment) until the reticle scale can be clearly seen. Adjustment of null (also called calibration): Open the daylight plate. Place one or two drops of distilled water or R.O water on the prism. Close the daylight plate and press it lightly so the water spreads across the entire surface of the prism without air bubbles or dry spots. Allow the sample to remain on the prism for approximately 30 seconds. Then adjust the calibration screw to make the light and dark boundary coincide with the null line. 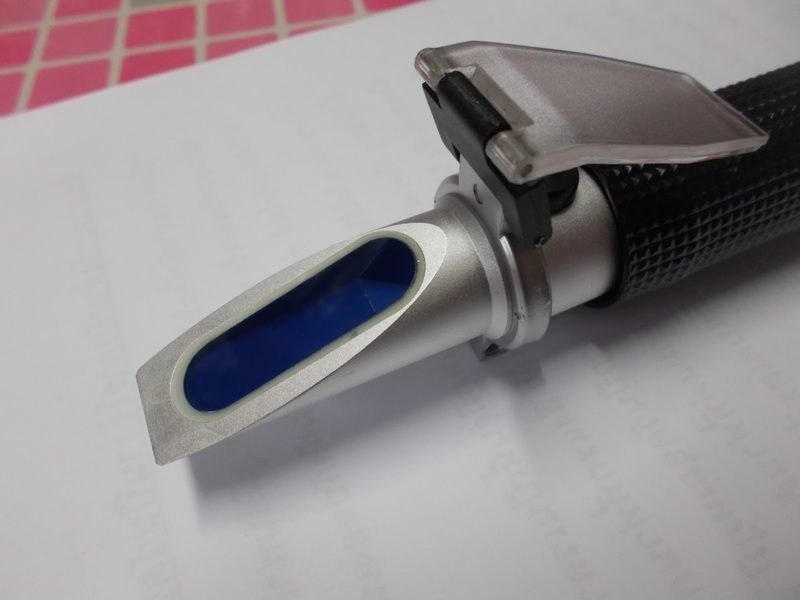 Adjustment of refractometer should be made under the condition of 20°C (68°F) environmental temperature. When the working temperature of the room or environment (not the sample) changes by more than 5°F, recalibration of the refractometer is recommended to maintain accuracy. The refractometer should also be adjusted to null before storage. Open the daylight plate and clean the surface of the prism with soft cotton cloth. Drop 2-3 drops of solution to be measured. Close the daylight plate. Press it lightly so the water spreads across the entire surface of the prism without air bubbles or dry spots. Allow the specimen to remain on the prism for approximately 30 seconds, and then read the corresponding light/dark boundary. The reading is the Brix value of the measured solution. After measurement, clean away the measured solution on the surface of the prism and daylight plate with moist cotton cloth. After drying, it should be stored properly. Recalibrate occasionally to ensure and maintain the testing accuracy. Adjustment of null: Liquid and specimen should be under the same temperature. If the temperature varies greatly, the null point should be adjusted once every 30 minutes. 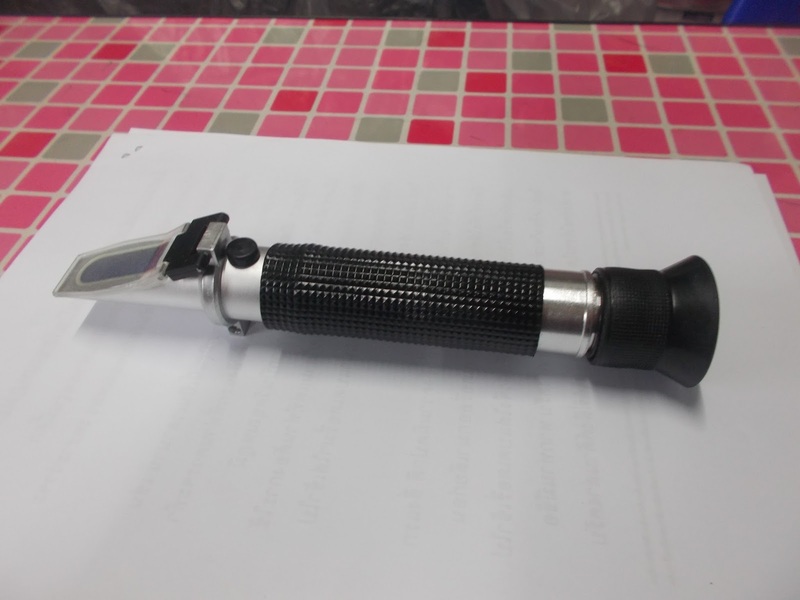 Do not use water to wash the refractometer after use to prevent moisture from entering the instrument. As it is a specialized precision optical instrument, the refractometer should be handled gently and taken good care of. Don't touch and scratch the optical surfaces. It should be kept in a dry environment with clean and non-corrosive air, to prevent the surface from turning moldy and foggy. Please use the protective carrying case to avoid strong shocks during transportation. If the consumers use the instrument in accordance with the method of usage specified, it can be guaranteed that the instrument will be operational for quite a period of time, with its optical performance unchanged.